♠In physics, circular motion is a movement of an object with constant speed around in a circle in a circular path or a circular orbit. 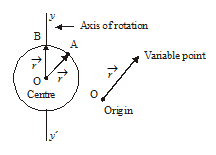 ♠ Circular motion involves acceleration of the moving object by a centripetal force which pulls the moving object towards the centre of the circular orbit. Without this acceleration, the object would move inertially in a straight line, according to Newton’s first law of motion. Circular motion is accelerated even though the speed is constant because the velocity of the moving object is constantly changing. ♠ Examples of circular motion are : an artificial satellite orbiting the Earth in geosynchronous orbit, a stone which is tied to a rope and is being swung in circles (cf. hammer throw), a race car turning through a curve in a racetrack, an electron moving perpendicular to a uniform magnetic field, a gear turning inside a mechanism. ♠ A special kind of circular motion is when an object rotates around itself. This can be called spinning motion. Suppose a particle is moving in a circle of radius r and centre O. The position of the particle P at a given instant may be described by the angle between OP and OX. This angle is called angular position. As the particle moves on the circle its angular θ position changes. Referring to the above figure, the angle between initial and final positions of the particle, which it tends on the axis of rotation, is called displacement. In Fig. 5.3 is the initial and is the final position of the particle. SI unit of angular displacement is radian or simply rad. SI unit of angular velocity is radian per second or simply rad/s. Instantaneous angular velocity: It is defined as the limiting value of the average angular velocity of the particle in a small time interval, as the time interval approaches zero.